Before our date with a gaggle of Macans last week, we went to Facebook to ask you, the readers, what you were most interested in learning about Porsche's new puts-the-sport-back-in-SUV Macan. You asked some interesting questions that were certainly worth answering, and we did our best to find out for you. We want to connect you to the car, and provide you with as much information as you need to make your informed and intelligent Porsche-buying decisions. Stay up to date with future fan questions by liking us on Facebook. Is the Turbo worth the money over the S? Admittedly, the jump between the Macan S and the Macan Turbo is quite a hefty one. The S starts at $49,900, while the Turbo is priced starting at $72,300. Outside of the increased power, slightly better brakes, and standard PASM, the cars feel very similar. The power is the most easily noticeable difference between the two. The Turbo's 3.6 liter V6 is bestowed with an extra 60 horsepower over the 3.0 liter V6 found in the S. The standard equipment Porsche Active Suspension Management of the Turbo is also optional on the S model, and in my opinion, 100% necessary. If you ever plan to drive your Macan aggressively, or in a sporting manner, the PASM will only work to instill confidence in the car's abilities, and make it that much easier to drive quickly. As you don't have to spend the $1360 on PASM when buying a Turbo that you would when buying an S, it helps soften the higher MSRP blow a little. The brakes feel as though they provide similar stopping power on both cars on the street (the S carries 350mm front and 330mm rear brake rotors, while the Turbo is gifted 360mm front and 356mm rear rotors). With that said, the Turbo's braking capabilities certainly shine on the track. When pushed to the limit, the Turbo braking system feels a bit more taut, and a little more capable. The initial bite of the larger rotors is nice, but both cars fall short in braking feel when compared with a traditional Porsche sports car. If you really need your cute ute to stop quickly, though, hold out for the Porsche Carbon Ceramic Braking package, which should be released in the US shortly for both models (though Porsche won't commit to when). When compared with any number of other small 'sporty utes', however, either Macan stands head and shoulders above the competition. Long story short, were it my own money being spent, I would have a hard time justifying the step up to the Turbo model. The 'S' model car is capable enough (when optioned with PASM) that I could certainly live with 'only' 340 horsepower and the smaller brake package. Is there enough cargo space to make it more desirable and versatile than a sports sedan? Compared to your average sports sedan, say an Audi S4, the Macan doesn't give up much in terms of sportiness, but gains a lot in terms of cargo space. An S4 sprints to 60 in 4.9 seconds, while the Macan is capable of doing the same in 5.0 seconds (when equipped with launch control), though the thing to remember here is that the S4 is only capable of that quick sprint with the manual transmission. Porsche's Macan can repeatedly knock down 5 second 0-60 after 5 second 0-60, while the Audi sedan driver would struggle to repeat similar times run after run. To further the argument, the S4 has less power than Porsche's Macan S, and is a much smaller car, yet their starting prices are surprisingly similar (Audi S4 starts at $48,100). Most buyers probably wouldn't be cross shopping the sport sedan with a Macan, but in this instance, it is pretty obvious that the Macan would be the better buy. On to the cargo capacity. Your average three-box style sports sedan will have a trunk somewhere in the vicinity of 12 cubic feet. With the seats folded down, manufacturers can then claim the full volume of the rear seat area, which is, of course, interrupted by the rear window and trunk decklid. The Macan has a nice bit of space in the back, with 17.7 cubic feet with the rear seats up, and a massive 53.0 uninterrupted cubic feet of space with the rear seats folded. Making things even better, though, the rear seat is split in a 40/20/40 setup, allowing a number of seat configurations to fit both the people you may need to fit, as well as the gear they may carry for a weekend trip. Skis, golf bags, or flat-pack Ikea furniture. 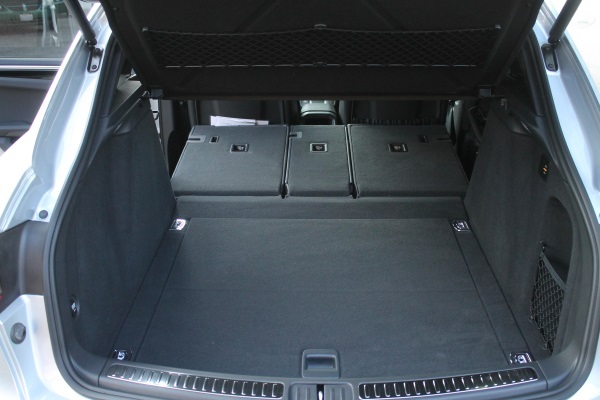 The rear cargo area of the Macan is quite versatile. As desirability goes, which would you rather own, an Audi, or a Porsche? Is the Macan worth the premium over an Audi SQ5? And what premium might that be? To put it bluntly, the SQ5 MSRP is $2,000 more than the base MSRP of a Macan S. The SQ5 does have a 14 horsepower increase over the Macan's 340 rating, but if I were a betting man, I'd wager you'd never notice 14 horsepower in any road driving situation. The Macan S is less expensive, comes with a more performance oriented suspension system, and crucially, a tremendous 7-speed Porsche Doppelkupplung (PDK) gearbox. Audi's 8-speed Tiptronic torque-converter gearbox will forever stand in the shadow of Porsche's double clutch world-standard transmission. From what I've heard among the circles of automotive testers, Audi has been somewhat recalcitrant in releasing an SQ5 to compare directly against Porsche's Macan. That alone certainly speaks volumes. Can it beat a Cayman S in a drag? The Macan Turbo would issue the Cayman S a resounding beating in a quarter mile dash. When both cars are making full use of PDK and launch control, the Macan Turbo will run a 0-60 time of 4.4 seconds, which surprisingly, is point for point identical to that of the Cayman S in "Sport Plus". 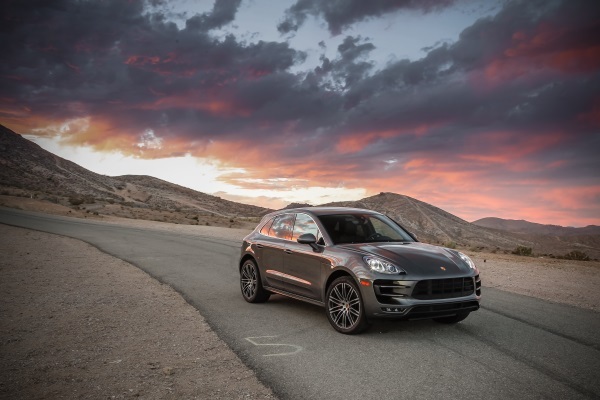 After 60 miles per hour, the weight disadvantage of the Macan starts to make less of a difference though, and the almost 100 horsepower advantage will start to widen the performance gap between the two cars. That said, the Cayman will suffer from less drag, slicing through the air much easier, which will only increase its advantage as speed increases. Though no official quarter mile time has been issued for the Macan Turbo by Porsche, expect it to come in just a tick or two under that of the Cayman's. The Cayman S has been tested to trip the lights at somewhere around 12.7 seconds in the '1320'. The Macan S definitely could not out-drag a Cayman S, but would give a base 2.7 Cayman a good run for its money. What engine size will come in the base Macan, diesel, and hybrid when they come out? The base Macan is already available for order in Europe and Asia with a Volkswagen/Audi group sourced 2.0 liter turbocharged four cylinder. A similar engine is available in the Audi Q5 and the Volkswagen Tiguan, on which the Macan's chassis is derived. The Tiguan has 200 horsepower, the Q5 ups that to 220, and Porsche's base Macan has even more, rated at 237 horsepower. The Macan S Diesel, like the base model, is already available in other markets, including Europe. The oil-burner engine is a 3.0 liter V6 with two turbochargers, making 258 horsepower and a massive 427 lb ft of torque. The unfortunate news here, however, is that Porsche currently has no plans to bring the Macan S Diesel to the US market. The official explanation is that there isn't currently a space within the chassis to mount an exhaust urea-injection tank. A similar reason was given for the absence of a Panamera S Diesel in the North American market. The Macan S Hybrid has not yet been officially announced in any market by Porsche, and no promises have been made. With that said, Audi does produce a Q5 Hybrid that Porsche could easily crib from their German stable mates to produce a Macan S E-Hybrid. The Q5 Hybrid uses a 245 horsepower version of the 2.0 liter turbo I-4 used in the base model, mated to a 54 horsepower 3-phase electric motor. Another option would be to assemble a reduced power version of the 333 horsepower V6 supercharged engine currently in use in both the Panamera S E-Hybrid and the Cayenne S E-Hybrid. Whether either of these options ever come to fruition is yet to be seen, but we certainly hope they do. Why doesn't illuminated entry come standard? Currently Porsche doesn't offer illuminated door sills as standard on any of their cars. While not listed on the regular options list for the Macan, it is available (for an additional fee, of course) to select from a list of Porsche Exclusive bespoke options. When will they have a sport exhaust button? Porsche currently has the Sport Exhaust option slated for November of this year, though they have also said that this would be "the earliest" that the option would be available to order. While I realize this question was meant in jest, it certainly isn't far from the truth. When you get the car set up for a launch-control launch (Put PDK in manual shift, turn off the traction control, left foot on the brake, right foot on the gas, when the computer says launch control activated, left foot off the brake, hold on tight), you'd better be prepared, because it'll really set your head back in the headrest. The acceleration is pretty snappy for a sport ute, and the Macan makes it so easy to move quickly. If you're going to access the acceleration-by-supreme-being launch control, you'd better make sure the road ahead is well clear of any slower traffic. If you are looking for a single car that can do everything you might want a car to do, then yes, the Macan might be the car you'll want to pay for. When you compare the Macan to its competition. It is more dynamic and subjectively attractive than Land Rover's Evoque. We've already mentioned the comparison to Audi's SQ5. Mercedes is coming late to the small-sportster game with their GLA, and the GLA45 AMG might compare on power to Porsche's Macan, but likely won't come even close to the dynamism with which Porsche's chassis has been imbued. How well do they 'handle"? In a word, "surprisingly". The Macan is a surprisingly capable car. The little truck was immensely in its element when bombing through the canyons north of Los Angeles. It is at home in the 50 mile per hour sweeper corners up in the hills. When equipped with PASM, even the standard steel-spring suspension is capable of providing the driver with a lot of feedback and a very confidence inspiring driving experience. In one of our driving sessions, we were given access to the undulating "Horse Thief Mile" at Willow Springs, driving three different Macan S models back to back. The first car equipped with the standard steel springs without PASM, the second with steel springs and the PASM box checked, and the third car fitted with Air Suspension and PASM. This was a nice exercise, as it allowed us to really feel the difference between the three levels of suspension on the same track, the same day, the same temperatures, and the same tire. With other variables removed, it was easy to see how each step up the ladder was more capable than the last. Standard steel springs were nice and comfortable, but the car did seem to wallow a bit, and had noticeable understeer. PASM, when added to standard steel springs, gave the car a much more neutral feel (though understeer was still present) and I was much more confident braking later into the corners and accelerating earlier. The air suspension was just the cherry on top of the PASM ice-cream. In sport mode, the air suspension lowers the car an additional 15mm, decreasing the weight transfer and increasing driveability and confidence. We'll have more on this in our other reports on our time in the Macan, so keep an eye out for that later this week. Still Have More Questions About The Macan? We answered what was asked, but if you didn't have a chance to relay your question you can do so below. Simply comment on this post and let us know what you want to learn about the Macan? If we don't know the answer we'll find out for you and update this post. One question: how well does it tow? My Cayenne S is a champ on this, but I’d like a smaller, more versatile town car that could also tow reasonably well (cars, small boats, etc). I could then combine my SUV and my “town chores” car needs into one vehicle – what a thought! Amen, Ronald, a urea tank is larger than a Hybrid battery pack? Really? How does it compare to an Audi Allroad? The current Allroad is only available with the 2.0 liter turbo four rated at 220 horsepower. I have not driven a new generation Allroad, but I wouldn’t imagine it would be cross-shopped heavily with a Macan. The Macan is just leaps and bounds faster, more advanced, and subjectively attractive. What are mpg figures for the S and Turbo? Real world? This past weekend driving from Lexington Kentucky to Chicago at Sunday early morning (3:00 am) using Adaptive Cruise Control set at 70 mph for 200 miles (I was curious about max MPG too) the car’s Trip Computer registered 24.1 MPG. Not bad! This past weekend driving my 2015 Macan Turbo (7,500 miles old) from Lexington Kentucky to Chicago Sunday early morning (3:00 am) using Adaptive Cruise Control set at 70 mph for 200 miles (I was curious about max MPG too) the car’s Trip Computer registered 24.1 MPG. Not bad! The Macan unfortunately is not a Porsche, therefore, it is not worthy of the badge or price premium. It is made in Leipzig not Stuttgart and has an Audi V6 not Porsche flat 6. IF it was made in Stuttgart with a Porsche flat 6, had air suspension clearances from 120mm to 240mm and lost 300kgs it would be worthy of the badge like a 991and the current Boxster and Cayman. I’ve been waiting for years to replace my Lexus H400 with something more German in feel. I don’t love the BMW products, think Mercedes has lost it’s mind and Lexus .. just has gotten ugly and boring with every successive year. Who am I? I’m a fashion conscious woman, successful, who drives a lot! I want a a sporty crossover vehicle that is well designed mechanically , has a luxury interior and is pretty to look at. I have been totally excited about the Macan, but really.. the gas mileage is inexcusable. They are going backwards in time.. given the general cost of fuel ( not the current low pricing) . And respect for the environment. Porsche.. please do not table the hybrid model for this gorgeous car! I’m here and ready to plunk down the money.. but want the whole package. Beauty, handling, design and respect for the planet and fuel use. Does the air suspension provide more cushioning/damping over rough and broken pavement than the steel spring suspension? 1. Traveling on a dry paved surface, level terrain, constant speed. Is it now 100% rear wheel drive? 2. Traveling on a gravel road, level terrain, constant speed with off road mode engaged. What is the torque split now? Also, is there a maximum speed where off road mode will remain engaged? There is a torque split gauge on the dash under “info” with colorful graphics to entertain. I took my golf club driver with me to the showroom to test the truck space for a normal set of clubs and was concerned they wouldn’t fit in and certainly not two sets as they would need to be placed diagonally. So I’m going to look at a Cayenne or another brand. Am I wrong on that? How do I adjust my Macan 2017 headlights so I can drive in Europe ?